1 Put the cherries and black forest fruit in a saucepan with the sugar and 2 tbsp kirsch. Bubble briskly for 20-25 minutes, stirring occasionally, until syrupy and reduced by 1⁄2. Set aside to cool, then chill completely. 2 Cut the top off the panettone with a large serrated knife. Run the knife around the inside, before scooping out the centre; take care not to tear the base and sides. Reserve the removed panettone filling and use to fill any gaps, if needed. 3 Remove the packaging from the gelato and cut into 1cm slices. Place 1 slice inside the panettone, filling any gaps with torn pieces from the centre of the panettone, and splashing over a little of the remaining kirsch. Spoon in a thin layer of the fruit compote and top with a layer of clotted cream ice cream, flattening the surface with a spoon. Repeat the layering, until you reach the top of the panettone (depending on the size of your panettone, you might not use all of the compote and ice cream). Replace the lid, wrap tightly in cling film and freeze for at least 4 hours, or ideally overnight. 4 Remove from the freezer 15-20 minutes before serving to soften. 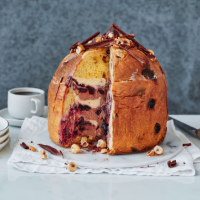 Cut the panettone into slices, topping each with the shaved chocolate and toasted hazelnuts.